It was a sunny yet chilly day Wednesday as people gathered for our weekly meeting at the Ridge. George Schoen was checking people in and Marc Glass was selling raffle tickets as Happy Jack performed his Sgt At Arms duties. Chickie Amberg was a welcome sight, joining our meeting and talking about how much the club meant to our recently departed friend Dave Amberg. President Kevin rang the bell promptly at 12:15 to start the meeting. 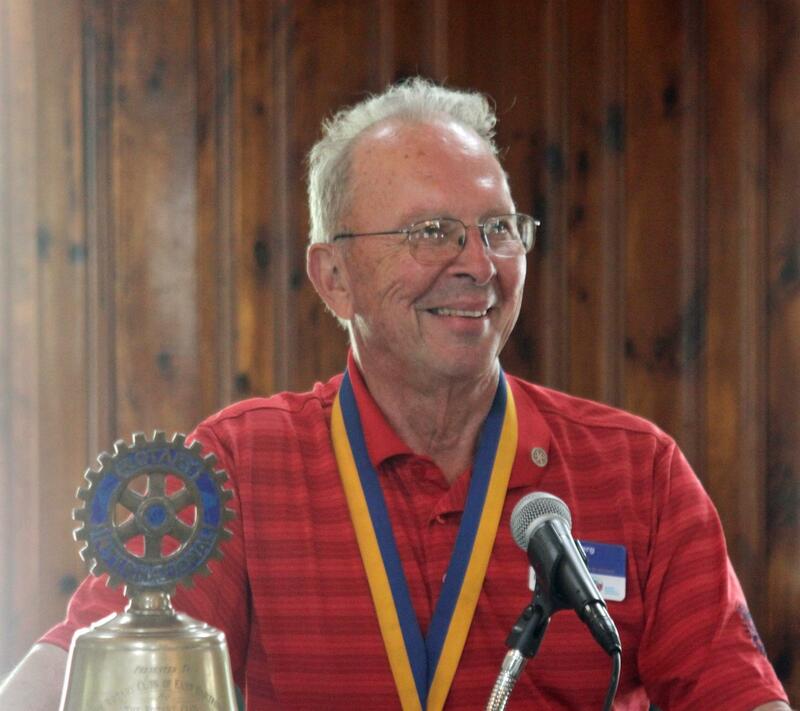 After the song and pledge, Bob Wood gave a heartfelt invocation, describing Dave as a someone that we can all look to as inspiration to show a little more, give a little more, and be a little more active in Rotary. He thanked God for Dave’s time on earth. He will be greatly missed. After a lunch of sausage and peppers over white rice, salad, bread and cookies for dessert, President Kevin began the meeting proper. Arranging his agenda out loud and on the fly, President Kevin called for the Welcome song to be sung. He then presented Anwar Hossain a Paul Harris Fellow +3 pin. Congratulations Anwar! Ned Lynch announced that he still has spots open for the Rock Cats game on May 29th. Happy Jack commented that the Yard Goats might be playing also. Whoever it is, please get in touch with Ned if you would like to attend. Marc Glass will be putting the word out amongst the District clubs as well. The District Conference is scheduled for May 3rd and 4th. This is a 5 District conference for which our District has 32 people attending. This is more than 3 times the number of any of the other districts. Given the low turnout, District Governor Elect Marc Glass is debating not even having one during his year at the helm. (This wasn’t well received so hopefully he falls on the side of having one.) This year’s conference will include a tour of Fenway park as well as a half hour in the batting cages. Rumor has it that the Red Sox players need extra time in them though, so this might be problematical. The conference also includes a harbor cruise. Bob Wood then, successfully, called for volunteers for invocations for the next 3 weeks. Bob Buettner announced Game Night April 27th at Bill Saunders clubhouse. No charge for Rotarians or family members. Please bring an hors d’oeuvre or dessert. The club will be providing beer and wine. Marc Glass will be providing 3 different frozen drinks. Bring publicly acceptable games with you if desired. President Kevin announced that Laura Floyd is in Cleveland celebrating the birth of a new grandbaby. Mom and baby doing fine. If anyone knows people in the East Hartford Little League, please encourage them to send us a grant request. As in previous years the club has allocated money to donate, but we have been unable to get in contact with them to get the process moving. Marc proposed giving the money to the Red Sox instead, as they might be more needy, but this was not well received. Kevin has received responses from three of the five foodbanks in town. Once we receive the other two he will schedule a check presentation during one of our upcoming meetings. Kevin praised Larry Hangland’s efforts publicizing our club in the East Hartford Gazette. Bob Wood expects the scholarship selection process to be completed by the end of May. Neal Cunningham encouraged people to sell, sell, sell those raffle tickets. Ceil Collins suggested that in the future we time the raffle so that it does not coincide with the Chamber of Commerce’s Duck Race. We are competing in ticket sales with the same audience, so this should be examined next year. The Sgt at Arms donations were many. Significant donations were made in memory of Dave Amberg, as well as the Boston Red Sox. Raffle winners were Bob Buettner for the 50/50 and Bill Saunders for the flowers. Our speaker was David McGuire, the Executive Director of the ACLU of Connecticut. He talked about the organization and what it has been championing lately. ACLU of Connecticut is 75 years old, and David has been with the organization for 12 years now. Another area of effort is in voting rights. They are working to amend the state constitution to provide for early voting, something many other states enjoy. Tolls are a big issue in our state, but no one is really talking about tolls in relation to Privacy. ACLU CT is pushing to make sure that data on people’s movement around the state is not kept long term. In criminal investigations and Amber alerts that data should be accessible immediately, but the state should not be allowed to keep it long term or sell the information to private businesses. One example given was Billboard Companies, which would love to know when your demographic passes their signs. 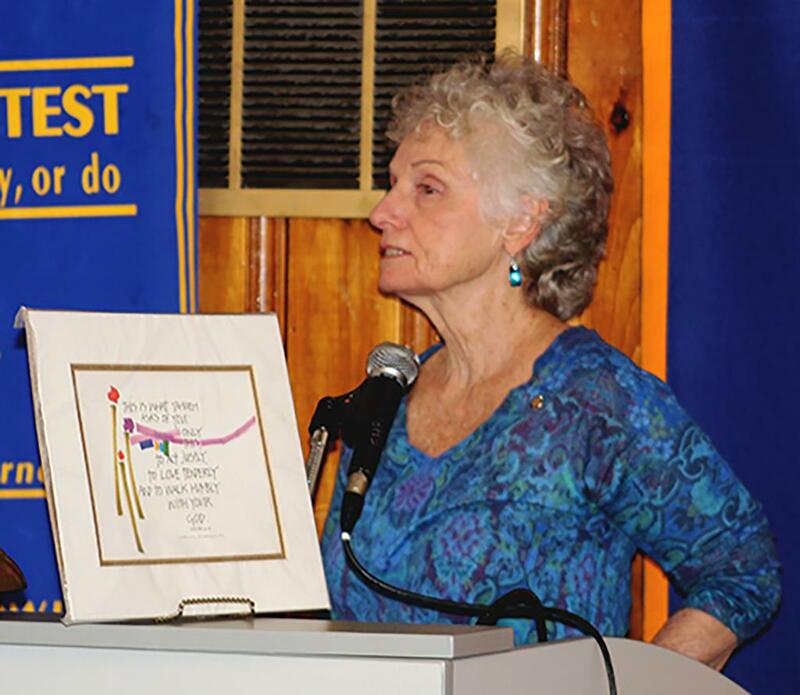 Our meeting concluded with Chickie Amberg sharing her thoughts about Dave’s relationship with Rotary, as well as talking about their life together. Dave had a saying hung on his wall that summed up his attitude about life: “This is what Yahweh asks of you, only this: to act justly, to love tenderly and to walk humbly with your God”. This was what encourage Dave to join the club (along with Bob Wood’s “pestering”). He found in the club friendship a spirit that coincided with his belief system (The four-way test), and a ready source of golf partners. The club taught him how to get involved in the community. Habitat for Humanity became a passion for him. 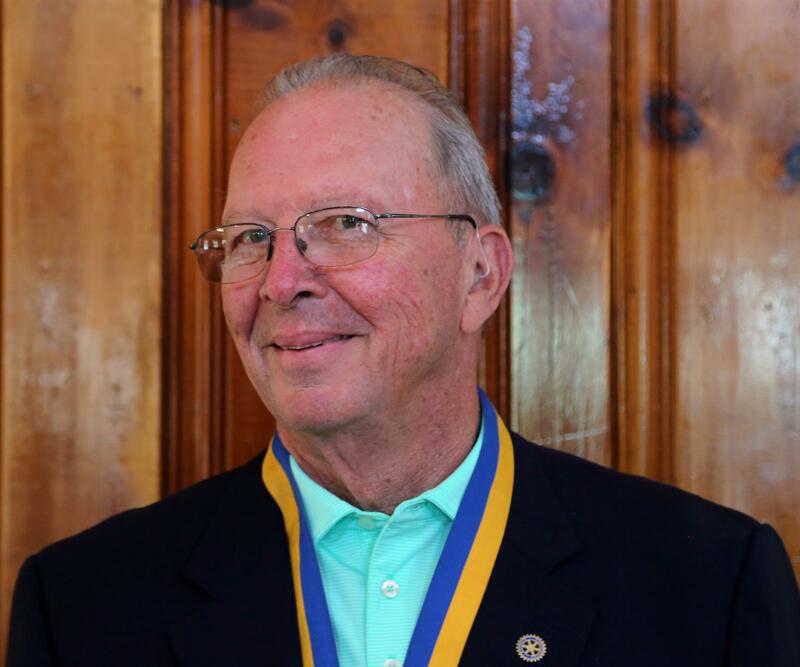 Dave loved Rotary so much that he stepped out of his comfort zone to lead us for a year as President. He was always ready to help when asked for our various efforts, such as the Marathon. Chickie told us she was extremely proud that he “showed up” for so many charitable causes. She then spoke about how she and Dave met, and how they spent their next life together. 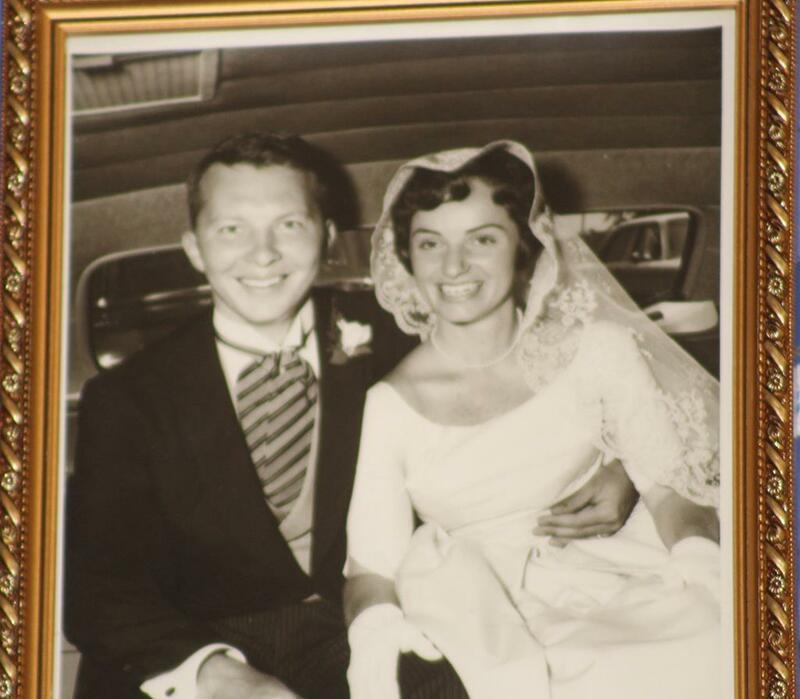 She shared many fond memories, giving us a window into their life together. Dave passed away quietly last Friday of bronchitis, without suffering, with the love of his life at his side. He will be greatly missed. God's speed, Dave.